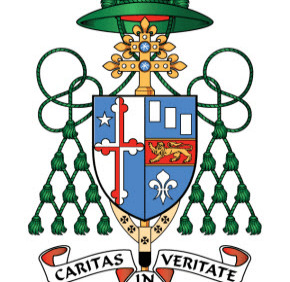 In addition to receiving a new ministry, Archbishop William E. Lori receives a new coat of arms. The artistic custom is a way of highlighting the archbishop’s priestly ministry and the traditions and principles that inspire and guide him. The coat of arms is comprised of three elements, the shield, the external ornaments and the motto. The following is based on a description by James-Charles Noonan Jr. The episcopal heraldic achievement, or bishop’s Coat of Arms, is composed of a shield, with its charges (symbols), a motto scroll and the external ornaments. By heraldic tradition, the arms of the Bishop of a territorial diocese, seen in the dexter impalement (left side) of the shield, are joined to his personal arms, seen in the sinister impalement (right side) of the shield. The archbishop’s side (right side) of the shield has been rendered in brilliant blue representing both the Blessed Virgin Mary and his family heritage. In Catholic heraldry blue is traditionally set aside as the color of the Blessed Virgin but it is also reserved to represent Catholic teaching, in particular the study of theology and philosophy and Sacred Scripture and canon law. As the bishop of each place is the ultimate teacher of the faith there in that place, blue also is used to represent the bishop as teacher and guardian of dogma and law within his see. Archbishop Lori has retained the fess (the golden bar at center in the original design, now replaced by the color red) found in the Lori family arms. In assuming his new office, Archbishop Lori wished to incorporate a specific homage to his mentor, Cardinal James Hickey, late archbishop of Washington. From the late cardinal’s coat of arms comes to the Lori design a lion standing on three of its four legs, the fourth leg raised forward, with the lion looking out upon the viewer, his tongue and claws rendered in blue, all set upon a red bar. This charge (emblem) was a dominant element of the late cardinal’s coat of arms and thus most appropriate for homage to him by Archbishop Lori. It now rests in a focal point, upon the fess which is rendered in red. Below the fess is found a single Fleur de Lys, the emblem of the Blessed Virgin, rendered in silver which in heraldry is depicted as white. Above the fess are found three heraldic emblems known as billets. These come to the archbishop’s coat of arms from his family heraldic design. Three of any one emblem (rendered identically) in Catholic heraldry is always also an honor to the Blessed Trinity. In staggering the three this harkens to the role of Father, Son and Holy Spirit, equal and exact but hierarchical all the same. The color of the billets is silver, one of the two Heavenly Attributes; gold and silver always being used for any emblem representing the Three Persons of God. The dexter impalement (left side) of the shield contains the Arms of the Archdiocese of Baltimore, originally commissioned by James Cardinal Gibbons, 9th archbishop of Baltimore. It incorporates a cross similar to those found in the arms of Lord Baltimore and the State of Maryland, but with important differences. The star suggests one of the titles and attributes of the Blessed Virgin Mary, patroness of the archdiocese under the title “Immaculate Conception.” It harkens to both the Star of Bethlehem when she gave birth to the Savior, and to the moment that the Archangel Gabriel announced God’s message to Mary of the coming birth of the Christ. The colors of the cross and background – red, white, and blue – distinguish the arms from that of the State of Maryland. Surmounting the shield of a metropolitan archbishop is the pontifical hat, the heraldic emblem for all prelates and priests of the Latin Rite of the Roman Catholic Church. For the rank of archbishop, titular, residential and metropolitan, the pilgrim’s hat is always worked in deep forest green, with ten tassels suspended on either side of the hat in a pyramidal style. The hat is properly known as the galero and the tassels take the name fiocchi. The interior of the hat is rendered in red, representing the possibility of martyrdom in witness to Christ. Behind the shield is found the archiepiscopal or metropolitan cross (used in liturgical procession when the metropolitan archbishop is present), denoted in the second, smaller transverse arm above the primary transverse arm. This cross is worked in gold, and has five Fleur de Lys emblems emanating from it. 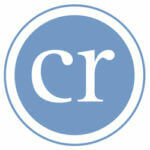 This is known in heraldry as the Cross Fluerity. The Fleur de Lys in Roman Catholic heraldry is reserved to honor the Blessed Virgin, including use in shrines and cities, and as such is fitting for use here, with the See of Baltimore being within Maryland, a See and state under the patronage of Mary. The stones –sapphire and the pearl – were selected as symbolic of the Blessed Virgin as well. The sapphire, in blue, is Mary’s heraldic color, while the pearl is representative of her eternal purity. At the base of the shield is found the representation of the pallium, the insignia of the office of the metropolitan archbishop. The pallium, a woolen band worn over the shoulders, is customarily conferred on each newly–named metropolitan archbishop at ceremonies in Rome on the Solemnity of Saints Peter and Paul each June 29. He wears it above his vestments thereafter within his province where his jurisdiction lies. In heraldry it is draped below the shield in a manner that depicts the five crosses found on the actual insignia, each cross representing the wounds of Christ on Calvary. In Church heraldry, a cleric’s personal motto has always been intended to represent his personal spirituality and theologically based philosophy of life, and is most frequently grounded in Sacred Scripture or in a prominent prayer or litany. For Archbishop Lori, this symbolism is found on the banderole (motto ribbon) in three simple yet powerful words: CARITAS IN VERITATE, “Charity in Truth.” Archbishop Lori’s original motto as bishop was In Caritate Servire, which is translated, “To Serve in Love.” Archbishop Lori has opted to select this new motto as he enters his new apostolate in Baltimore.